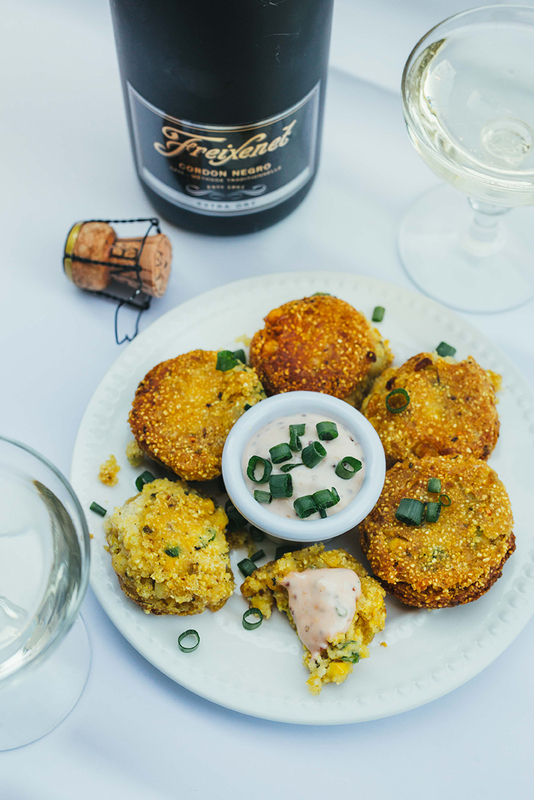 It is a very rare occasion that you see me fry anything in my kitchen, but since it’s the holidays and we are looking for a fun new recipe that goes well with bubbles to serve to guests, I thought I’d try my hand at converting a hush puppy recipe to be GF & V-friendly. I also decided to call them puppos, instead of puppies, because that is what our oldest daughter calls every dog. I’m amused by the small things, what can I say. Good news- they came out REALLY yummy! Like, really yummy. 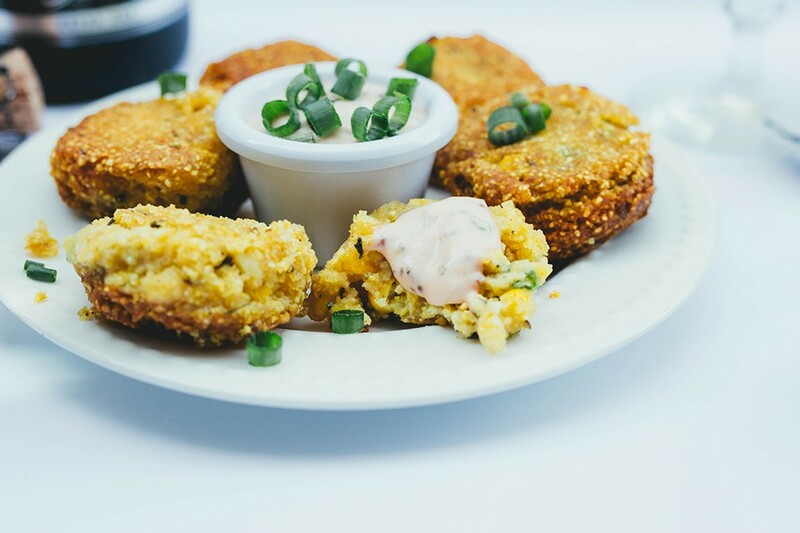 I was reminded slightly of crab cakes when I was eating them, something about the rich crispy flavor combined with the remoulade. I wasn’t complaining and neither were our neighbors when I brought them to the fence for a spontaneous happy hour, and they happily gobbled up the entire plate (you know who you are… *cough* the Muirs). Nothing makes me happier than getting to see other people enjoy the fruits of my labor. And when you have hot hush puppies (I mean puppos) and an open bottle of cava– you have to share! And they paired perfectly with this extra dry cava. More please! Lightly sauté the garlic, shallot and scallions on stove until lightly soft and translucent. Set aside. Add all dry ingredients (cornmeal, flour, baking soda and seasonings) to large bowl and evenly mix. In a medium bowl, whisk the "eggs" with the coconut milk, scallion/onion/garlic mixture and the 1 tablespoon of XVOO. 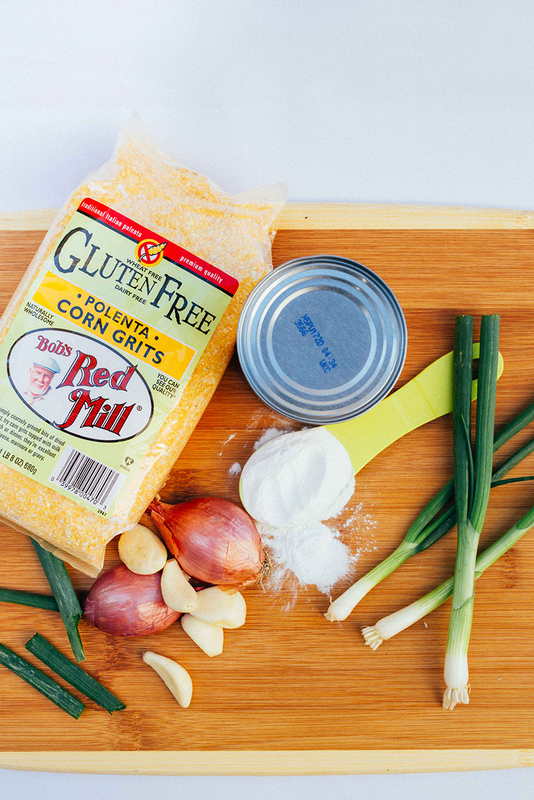 Stir the wet ingredients into the cornmeal mixture until just blended. Cover and refrigerate the batter for 1 hour. 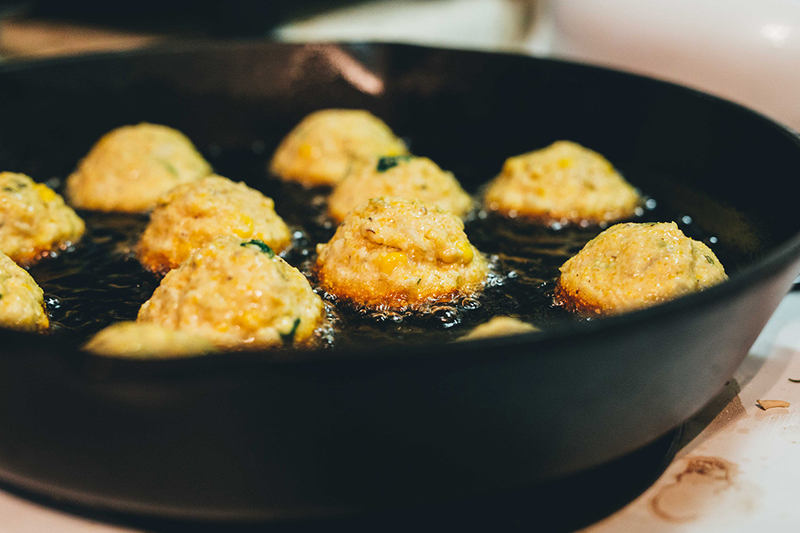 In a medium sized skillet or cask iron skillet, heat a hefty amount of oil (1/2 inch at least) to 325°. Set a large rack over a baking sheet. Drop 6 rounded tablespoons of batter at a time into the hot oil and fry, turning once, until the hush puppies are browned and crisp, about 2 minutes. Using a slotted spoon, transfer the hush puppos to the rack to drain. If needed to cook inside of puppos, bake at a low temp (around 250 F for 5-10 minutes). For the remoulade sauce: In a medium bowl, whisk the Vegenaise with the mustard, ketchup, cider vinegar and scallion. Mix and add salt and pepper to taste. Serve the hush puppies hot with the remoulade. These are best hot! The hush puppy batter can be refrigerated for up to 1 day. The remoulade can be refrigerated for up to 2 days.